download and install software on my computer. Knowing how to safely download and install software is an essential part of using a computer. Most of what most people do with computers today happens in a web browser. Many people have strong opinions about Microsoft’s Internet Explorer as well as Mac OS’s Safari. One reason to avoid either of them is that each of them works only on one platform, so things you do will be different from what others do. According to one source of browser statistics, as of April 2015 Chrome is used by 64% of the people. This is one time that following the herd is a good idea. If you ask someone how to solve a problem on the web, there is a good chance that their solution will involve using Chrome; if you use some other browser, you cannot heed their advice. Another reason that this is a good exercise is that , having two browsers installed on your computer can be handy if you want to, for example, log in to one site with two different accounts, or if you use a badly-designed web site that will not let you see multiple pages at once in multiple tabs (e.g., Sakai). You should download and install Chrome and Firefox. You should do this one your own, with no hints or instruction, except that you should download them from their canonical source. That is, Chrome should come straight from Google and Firefox should come straight from the Mozilla. Hint: Type “download chrome” and “download firefox” into your favorite search engine and follow the first link that is not an ad. Again, Chrome should come from Google. Firefox should come from Mozilla.org. If your search engine encourages you to download either of these from some other site, you should change search engines, and/or learn what ads look like. Evidence of success: Open both Chrome and Firefox so that both are visible on the screen, take a screen shot. Include in your message anything that seemed confusing that happened along the way and might help someone else following in your footsteps. If you get stuck, post a question in the help category. 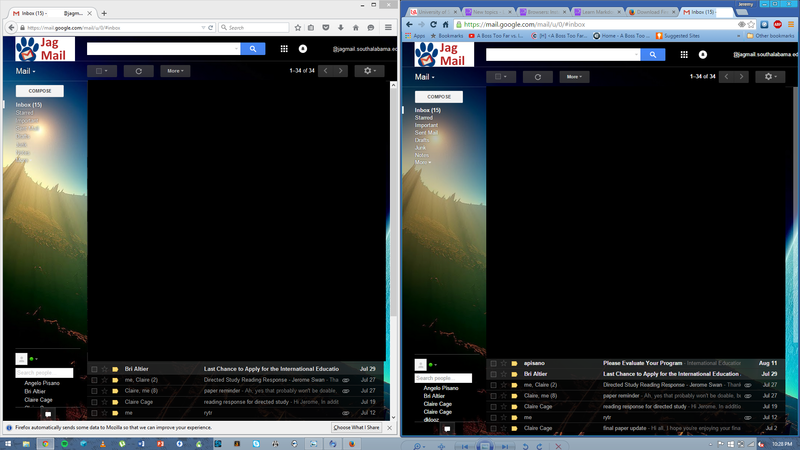 Already had these installed, just blacked out my relevant emails / account info. Nice work, but you don’t need to include all of the text from the original assignment. To make sure you see how things work, you should go back and edit your original post and take out the part that has my message. I knew to do that but left it in as I could not find an actual edit button, is there one or is it simply replying as a linked post again? Disregard that previous message I thought it was pertaining to the markdown assignment, I will make sure to do that in the future when I submitted that one I was in the middle of getting the categories to work and wanted to make sure that it would reference to the correct assignment. Discourse currently gives you only 4 days to edit a post. The default is two days. The reasoning is that if someone edits their post after a conversation about it has started the conversation may no longer make sense. I increased the time to 4 days, which I think is usually long enough.